Hmm I think some more Kingsbridge is in order! 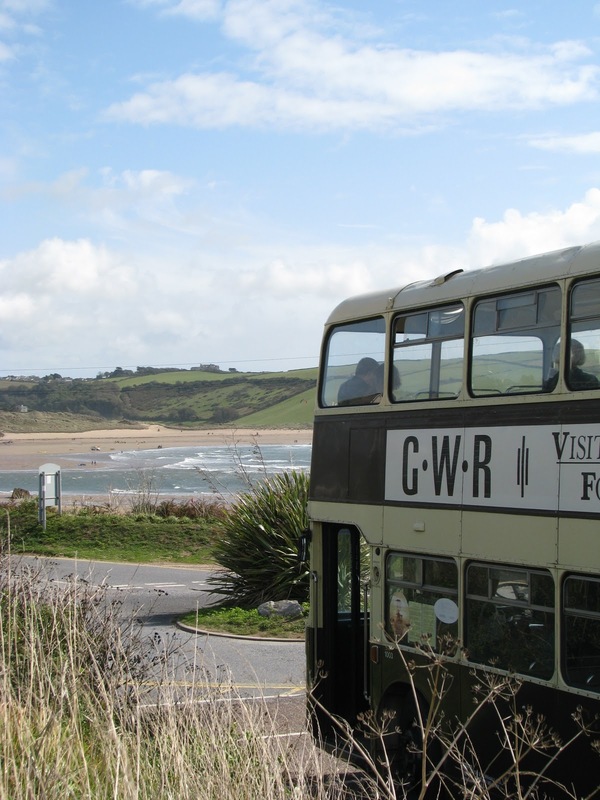 VRs for this weekend, and to kick of off, here's OTA 290G operating a 101 to Bigbury, passing VDV 141S returning into Kingsbridge. Here, VDV 121S leads Devon General Nimbus XTA 839 into Kingsbridge. 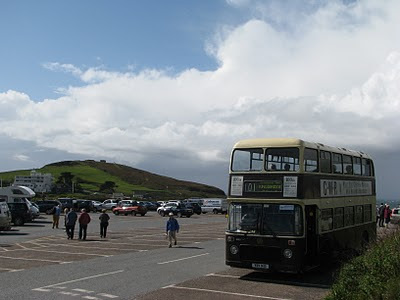 And lastly we have VDV 141S resting at Bigbury before returning to Kingsbridge on the 101. 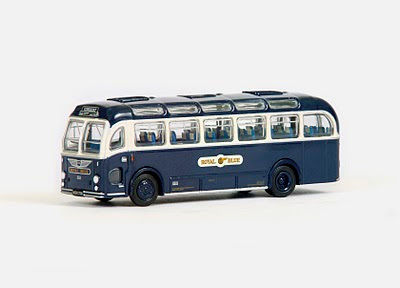 Tom Peace's enterprise, South West Transport Models, will be receiving stocks of two new local models in the coming month. 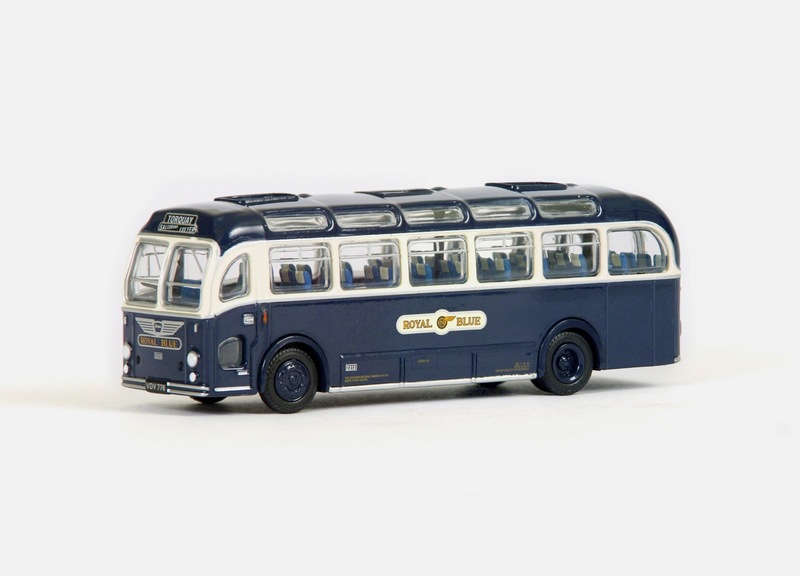 Firstly will be this Royal Blue liveried Bristol LS (apologies for incorrect information supplied before, don't blame me, blame Tom! ), VDV 776, fleet number 2213. 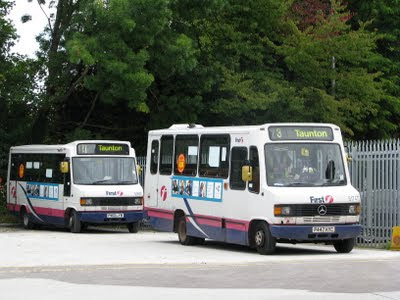 The model shows her working a Torquay, Sailsbury and Exeter service. 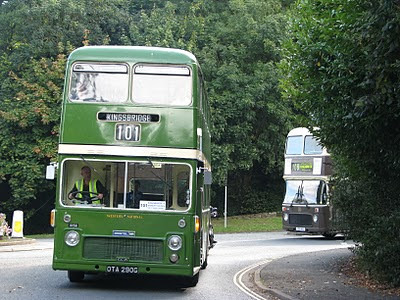 Secondly will come Leyland Olympian A680 KDV, 1804. 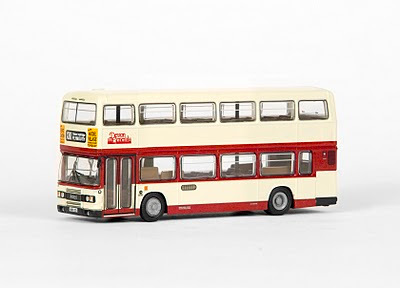 This Olympian of course still survives in preservation, and the model depicts her in the cream and red Devon General livery she currently wears. She is seen on the model operating an X80 service to Plymouth. 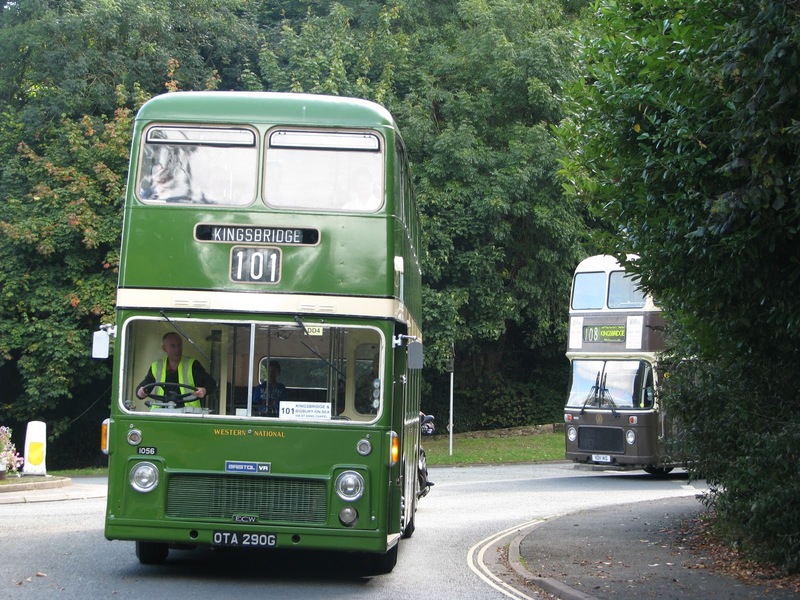 BOTH PHOTOS COPYRIGHT TO EFE THROUGH SOUTH WEST BUS MODELS. Luckily, Sunday hasn't completely seen off all the step entrance vehicles from the PCB fleet. If you look closely enough at around 5pm each week day, you can still find some Volvos out playing. 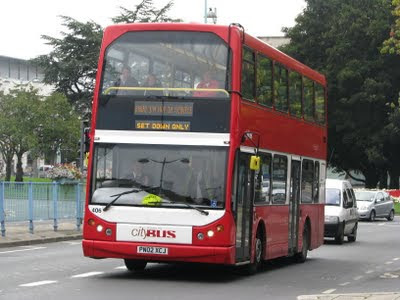 There are no less than 3 workings that are operated by the old B10Ms commencing in Derriford, with other routes also running B10Ms, if you can track them down! 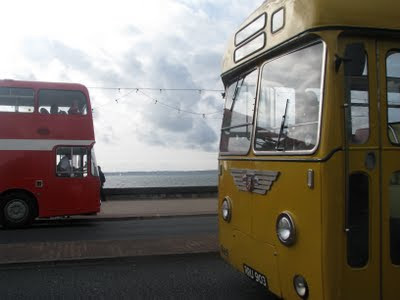 These of course are the various buses that have just come off the school runs, and therefore, why not send them back in service! Take advantage while you can though, the Volvos are slowly trickling away from the fleet. This was also the first time out for my brand new phone, so here are the photos it produces! I'll need to get the hang of it, but I was fairly impressed in the challenging conditions the Plymothian weather provided for me this afternoon. 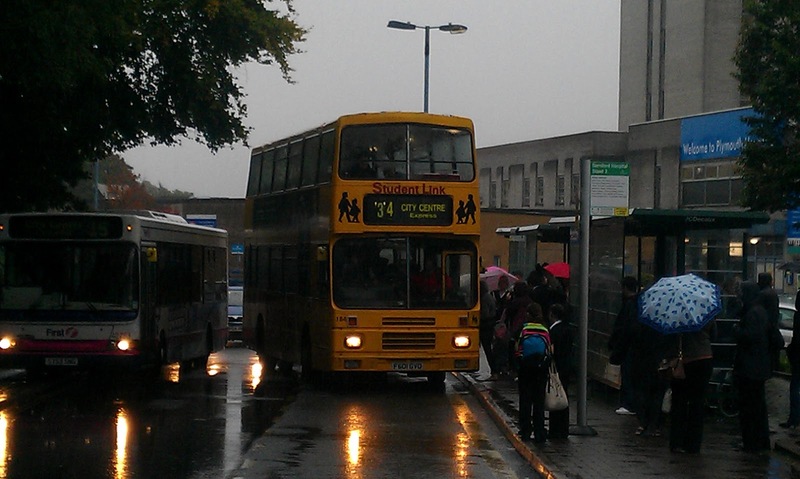 The other step entrance vehicle still going today, was L124 YOD. With big thanks to Jared Pengelly, who ran after this to be able grab the photo(! ), I am able to bring you this view of her operating on service 49. So the step Darts may linger on for just a little while longer, but they will be increasingly hard to track down! 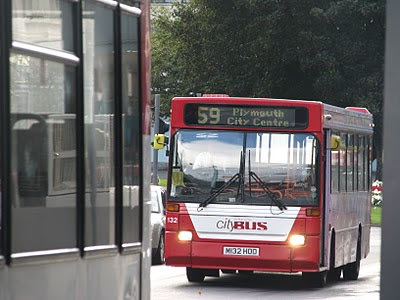 Saturday 17th September 2011 saw the step entrance Dennis Dart take to the roads of Plymouth for the final time in public service, operating on the final service 59 to be operated by Plymouth Citybus. Aptly, the Dart that had the honour of being the very last in service, was the final Dart to be delivered back in October 1994, M132 HOD. 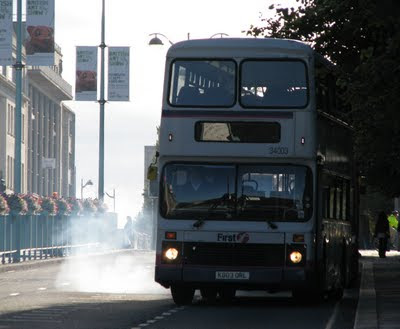 So here she is, 132 taking up her position for the final time on Royal Parade. This was the last time a Dart will ever commence its service in Royal Parade after departing right across the city thousands of times over her 17 year career. A big thanks must go to PCTPG group member, and Ex-PCB driver and conductor, Paul Burch, for providing the headboard to commemorate the final running. He stayed up into the early hours of the morning painting this up, and really did complete the look. So here we have, the very last passengers that will ever enjoy a ride on a step entrance Dennis Dart, a majority of which were enthusiasts. 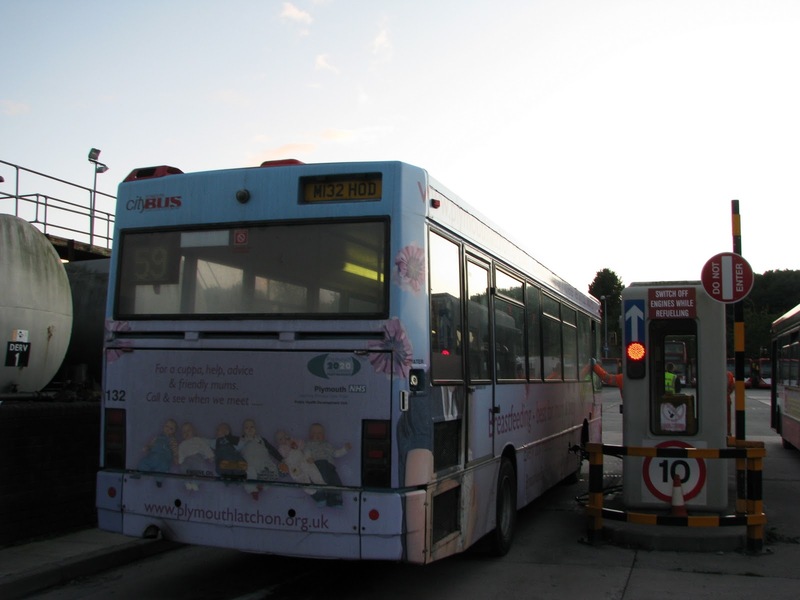 The two girls sitting prior to the wheel arch were very confused by all the attention M132 was getting, and inquired about the headboard, thinking that the bus service was stopping. 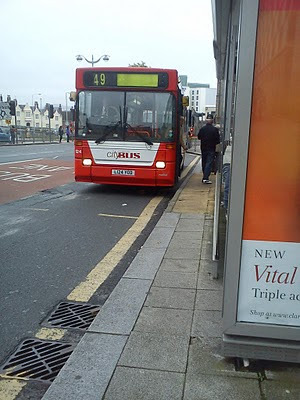 Technically, yes that is true, but since when was the route called "Dennis Dart"?! So here we have her paused in a couple of scenic locations along the way, firstly at Shaugh Prior, and then again outside the White Thorn pub, looking stunning. These really don't look their age, and even at 17, there was barely a scratch on her to tell her apart from a modern bus. So, there we have it. The step Dart is finally about to disappear from Plymouth after some 19 brilliant years of service. 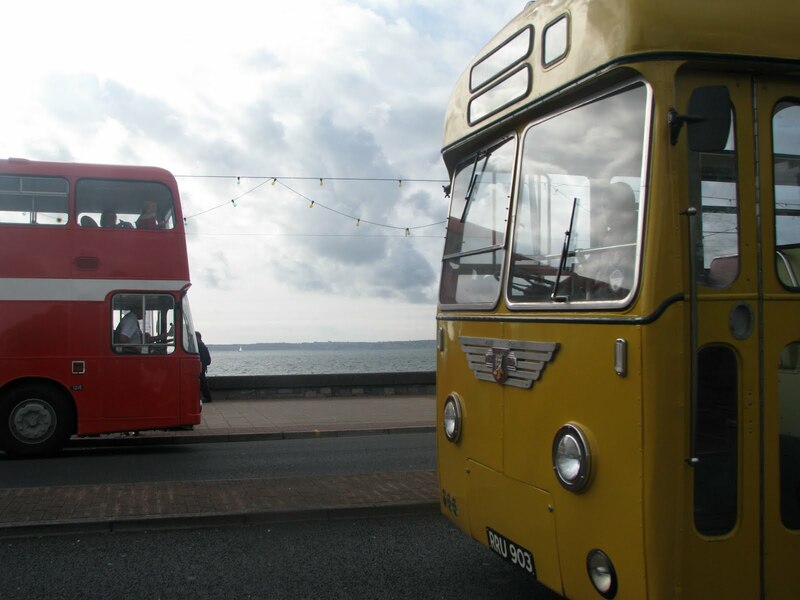 PCB simply won't be the same without these old, faithful stalwarts of the fleet. 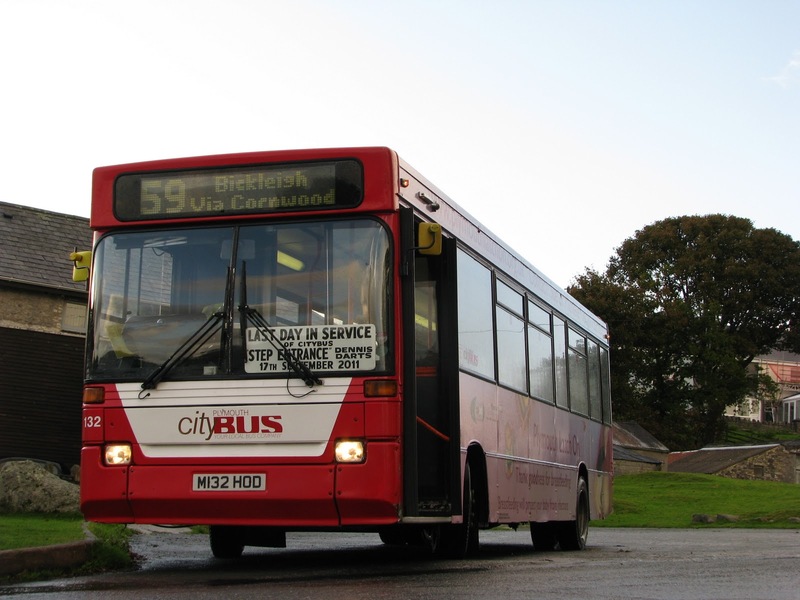 They were loved by drivers, and admired by passengers back in their day, but sadly, times move on and the public are beginning to 'expect' better, even when we may believe they have many a good year of service left in them. Endlessly reliable, powerful and comfortable. Their only real 'flaw' was the lack of low floor (excuse the pun)! I shall end by saying a huge thanks once more to all involved with organising the final farewell at Plymouth Citybus. There are very few companies that would make the effort to put on something like that for the enthusiasts to enjoy. And to our driver, Doug, for his kindness in allowing us to pause for photos, his friendliness all along the way and for giving me the last ever sign off ticket and end of duty ticket ever to be printed on an in service Dart. A really lovely occasion to end on. Goodbye Darts. We'll miss you! It was very hard picking the Snap on Sunday this week, after some great events over the weekend, and therefore I think a few 'photo' postings are due over the week. 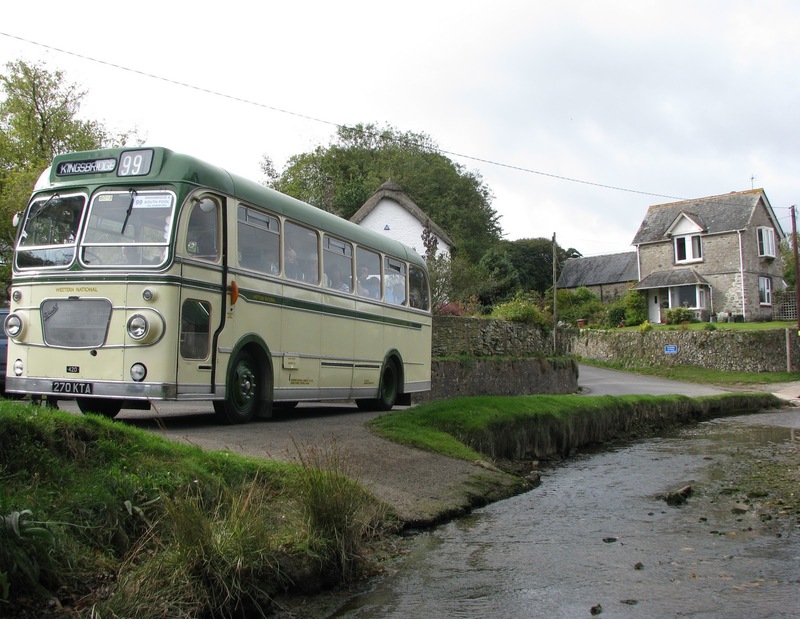 So to kick it off, here we have David Sheppard's Bristol SUL, 270 KTA. This was her first run out in service at an event for a number of years after the painstaking work that has been going on underneath the surface. Regular readers of David's blog, www.270kta.blogspot.com will know the huge progress that has been made with the coach since David acquired her from WNPG. 420 is pictured firstly at South Pool on her very first run out, basking happily in the sun next to the river. 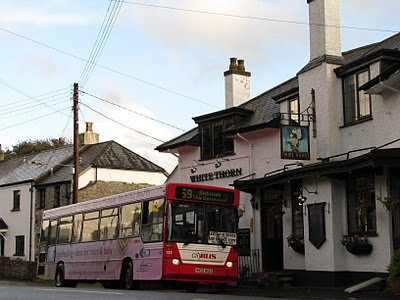 She is secondly pictured leaving Kingsbridge with Mr Sheppard at the wheel, with some of the Kingsbridge's finest floral display. And just for good measure, here's a similar shot to the first, with owner and conductor either side. This really is it, the step entrance Darts are finally on their last leg. With huge thanks to Plymouth Citybus, the last day of Service 59, will also see the last day of the step Darts in public service. 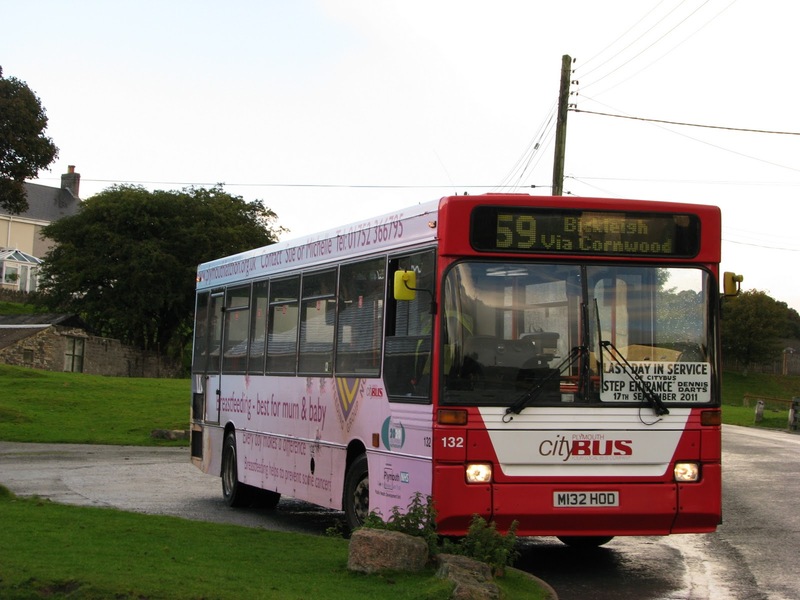 Route 59 will be run all day with these Darts until the end of service. 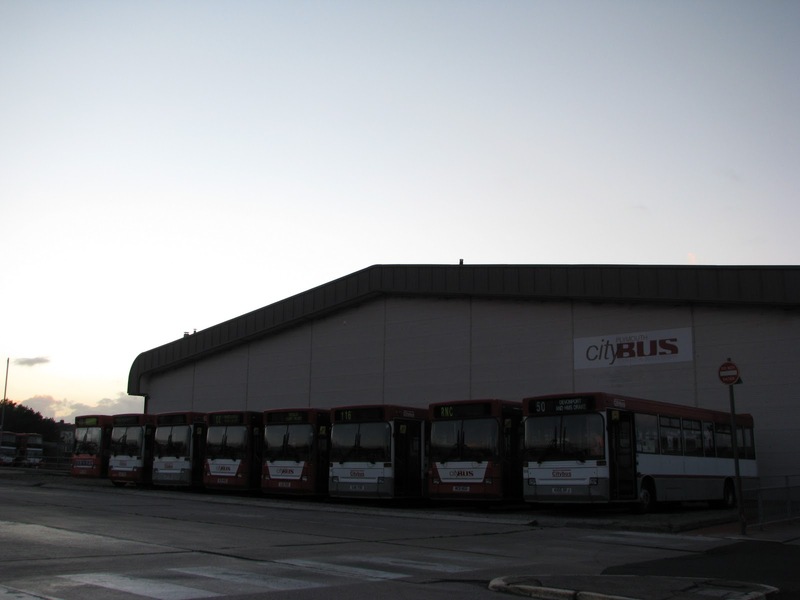 DENNIS DARTS - After 19 years of loyal service, our older step entrance Dennis Dart buses will be retired from normal service at the weekends. 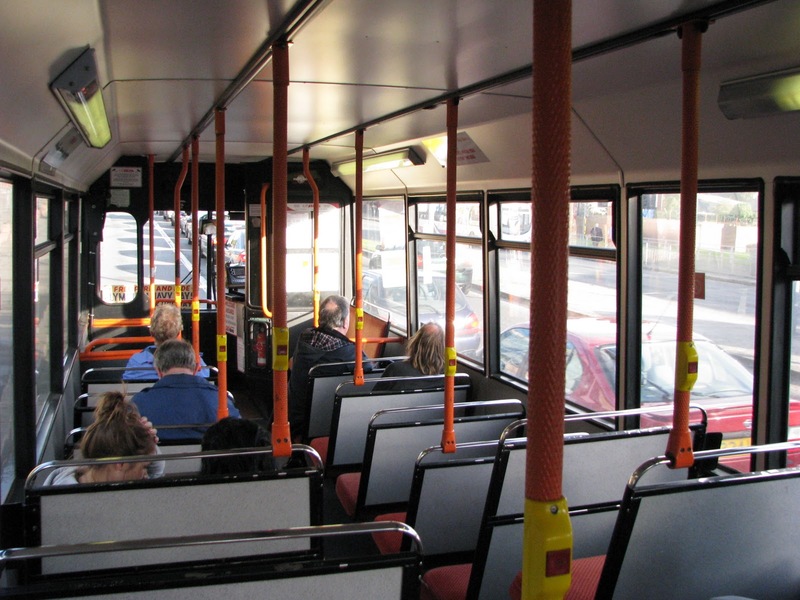 This means that all normal services, apart from school buses, will be low floor from Sunday. 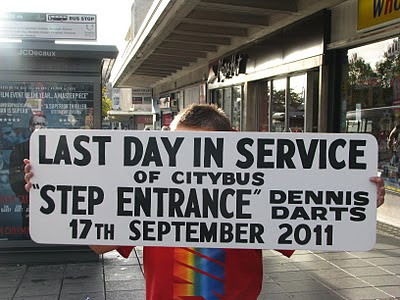 To celebrate this, the last day of service 59 on Saturday will be operated by the step entrance Darts, giving enthusiasts the chance of a final trip on them. So many of the big companies would simply overlook this, and the bus in question would just disappear from the streets of their respective towns, so I would go as far as saying its an honour, that Go Ahead are making the effort to run the Darts for us for the last time. 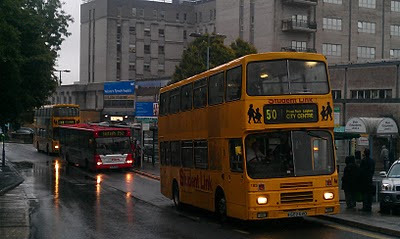 I've only seen Mini Pointer Darts on the 59 for some weeks now, so is lovely that they will be swapped back just one more time. This really will mark the end of operation of all step entrance vehicles in public service at PCB, excluding the school runs with the Volvo B10Ms, and the sole (?) remaining step Dart. 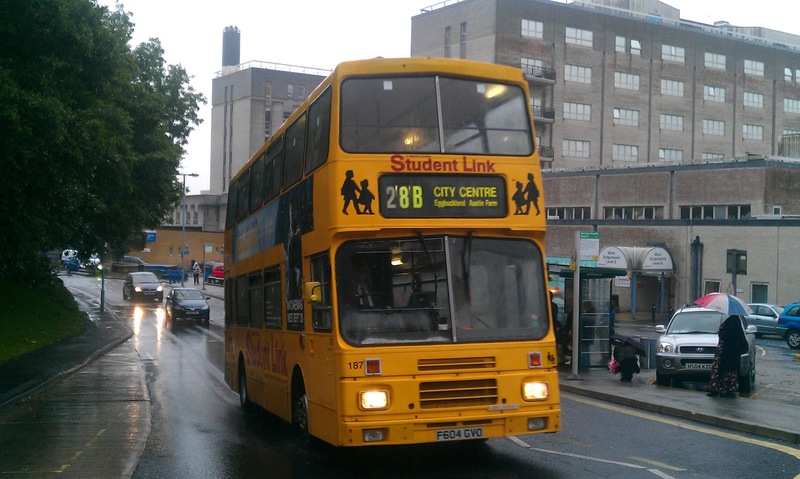 My sister travels on this last remaining service daily, so hopefully I will have an insight into when this bus also disappears from traffic for the final time. 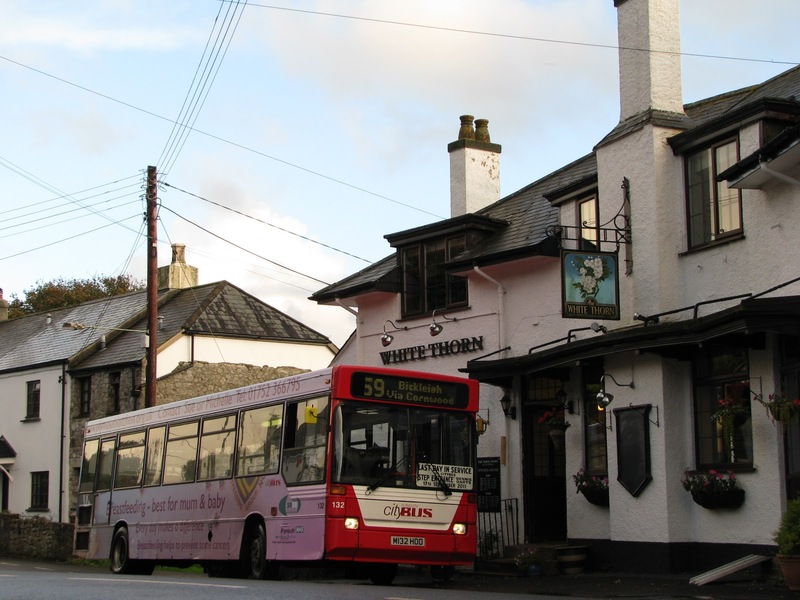 If you don't fancy a trip on a step Dart though, or perhaps do, but in a different location, then Kingsbridge is the place to be! 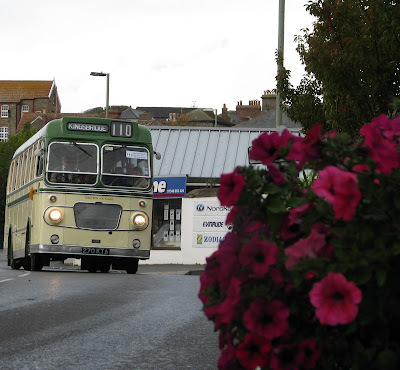 This Saturday will see the annual running day return to the town, but more on that tomorrow! The final service if anyone is interested, will be at 1750 from Royal Parade. 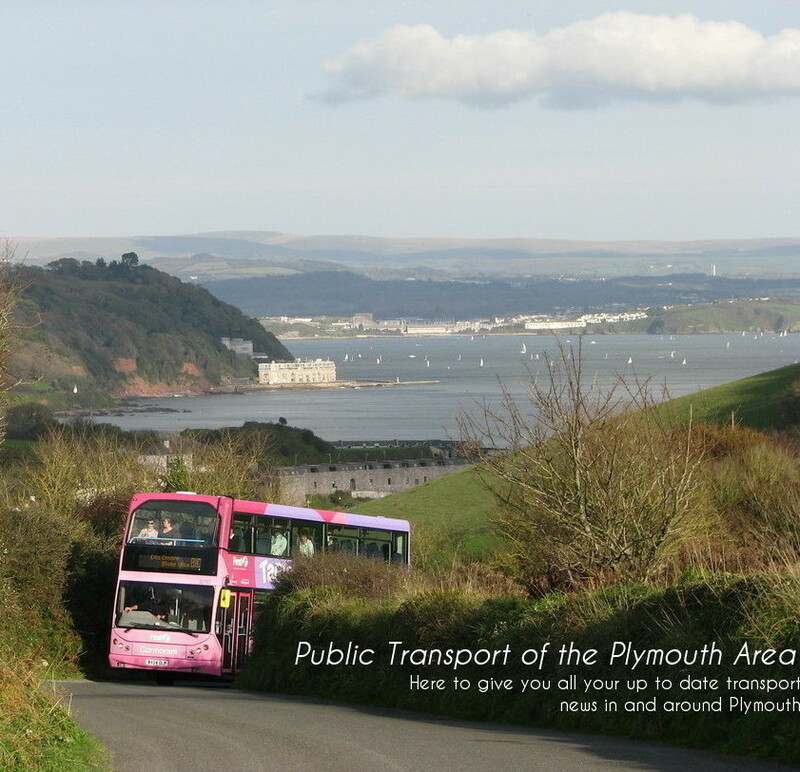 I believe the service terminates at the George P&R though, so does anyone know if the service will run in service back into Plymouth, or if passengers will be allowed on the dead trip back into Plymouth? A Volvo B7 winds its way through a very foggy Saltash early on a Saturday morning. Atmospheric! 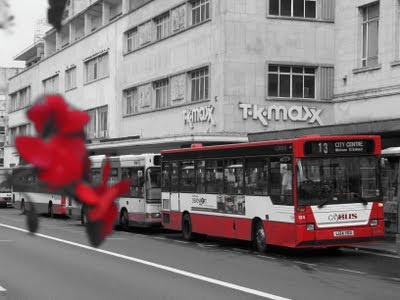 Lets have a look at it from a bus spotter's perspective! Nipped into Plymouth today to see what was going on in Plymouth as regards to the Cup, presuming to find Bretonside adorned with a motley collection of coaches carrying people on a trip to Plymouth to watch the cup. I was somewhat mistaken. Only 3 coaches on private hire were in Bretonside, 2 from Seawards, and 1 from Mid Devon Coaches. Maybe there was somewhere else that they were parking them, but there certainly wasn't much to see at Bretonside! So moving on, understandably the 25 was going to be a busy route for the day seeing as it circum navigates the Hoe and the Barbican, so there was a larger '51' reg Dart on today, rather than the norm of an MPD. While we're with PCB, there were also B7 deckers running around displaying 'Not in Service' throughout the afternoon carrying people. Whether these were linked to the event I'm not sure, but it seemed to make some sort of sense. 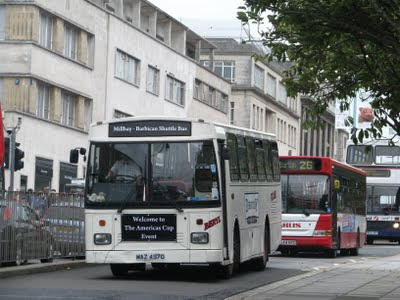 Moving on, Plymouth Discovery Tours are using their Leyland Leopard to run a shuttle service from the 'base camp' down at Millbay Docks, where all the boats are being kept, along with all the facilities, down to the Barbican and the Hoe for the spectators. A very reasonable £1 is being charged for the trip, running every 15 minutes throughout the 10 day event. 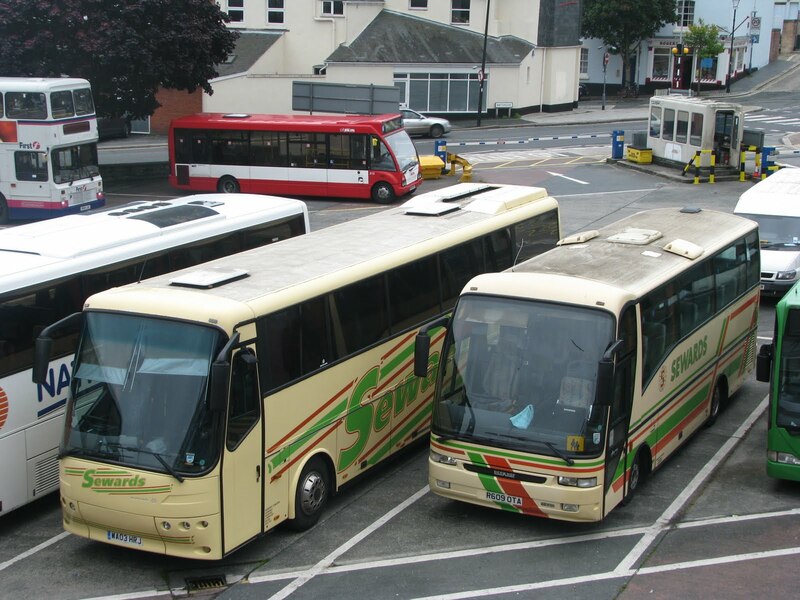 Its great to see the Leopard in front line service working hard, with so many enjoying the trip! 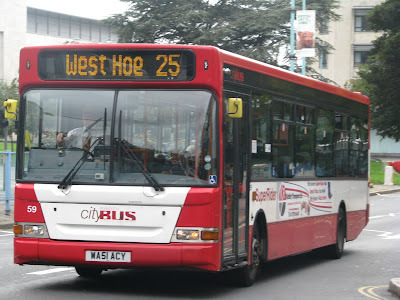 A proper bus. And finally, something you might not have expected! Recognise this Mercedes 814? You should. 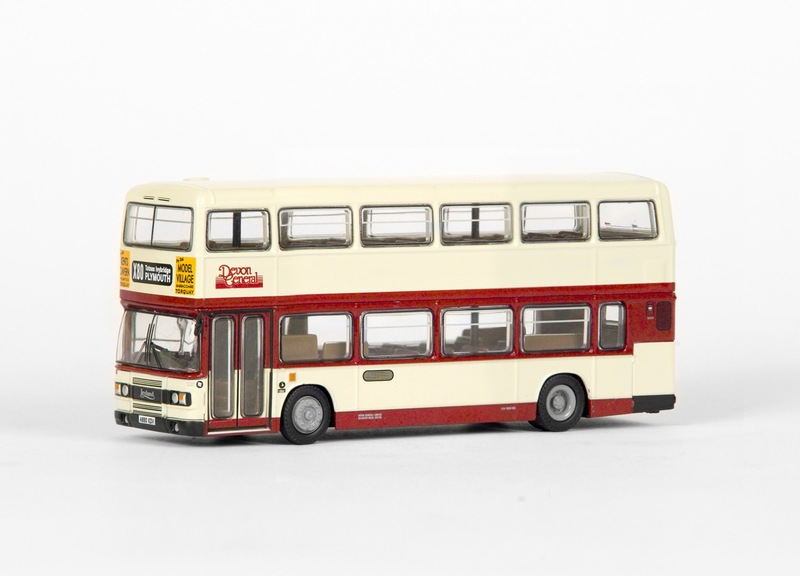 This is actually Target Travel's WCR 819, previously T360 EJM. 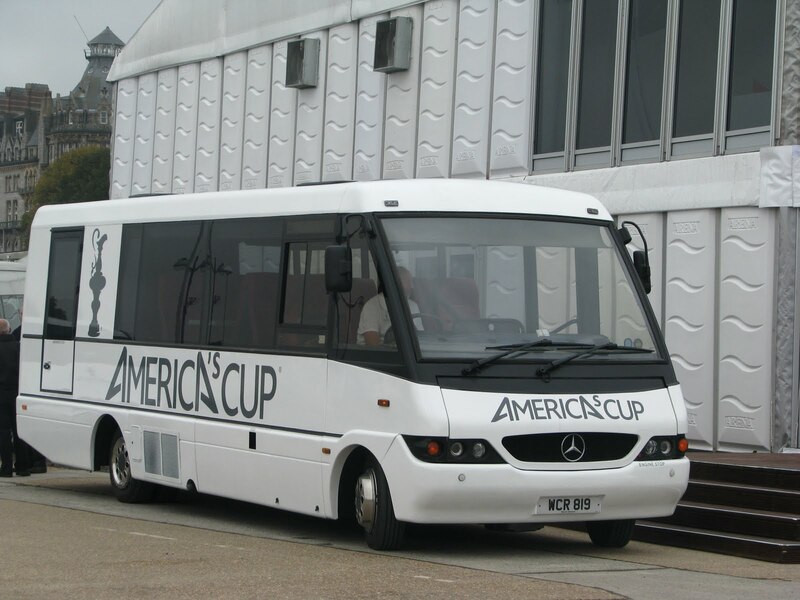 This is the luxury Merc you may have seen buzzing around Plymouth from time to time. The coach is fitted with very large luxury seating, tables, and if memory serves me, even some on board refreshment facilities. 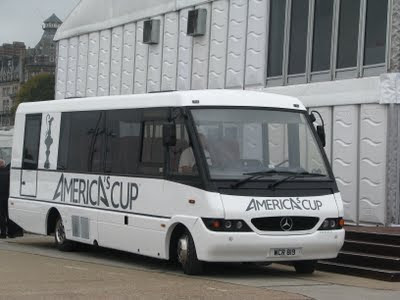 The Merc has had some America's Cup vinyls applied to her, along with new wheel trips to make her look the part. Very smart indeed! 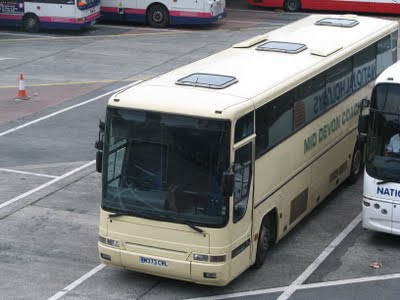 Personally, I think this Autobus bodywork on the Vario looks even better than the more common Plaxton Cheetah bodywork more usually found on the smarter looking 814s. So plenty going on if you're not interested in the sailing! Yes, believe it or not, the Mercedes 709 has returned to Paignton! Only on Saturday did I comment on the loss of them from the town. But here she is, M353 JBO back home in Paignton at 1900 today spotted by Kameron Allan. With thanks to Kameron, we can report she has been back out on her old haunt of the 5s, presumably covering for an ever reliable Optare Solo. 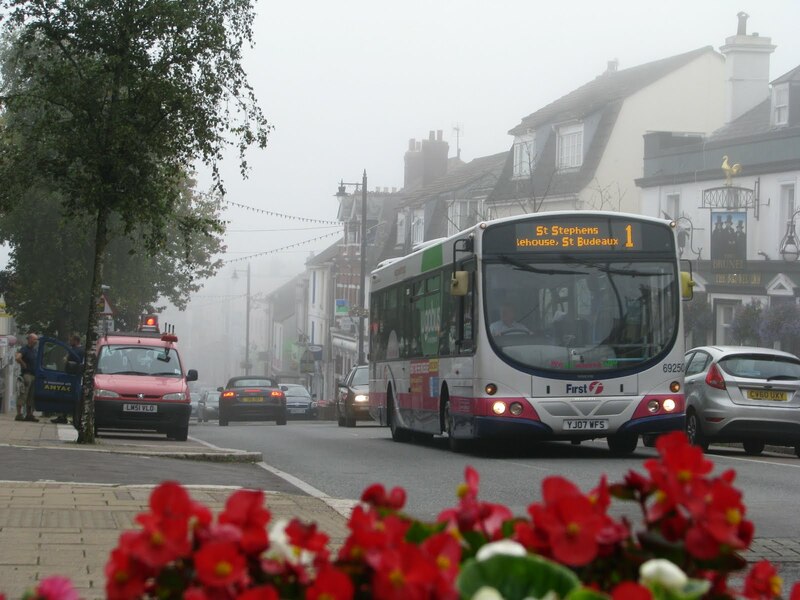 Perhaps it was slightly nieve of Stagecoach to get rid of all the 709s at once, without keeping at least one or two 709s in reserve for the time being, but certainly made the return of M353 even more special. Better go and grab it while you can though, as I doubt it'll be around for very long. Kameron has been telling me that there have been many comments from passengers and drivers alike, shunning the Solo already. Of course as with everything, you don't realise what you've got, until its gone. 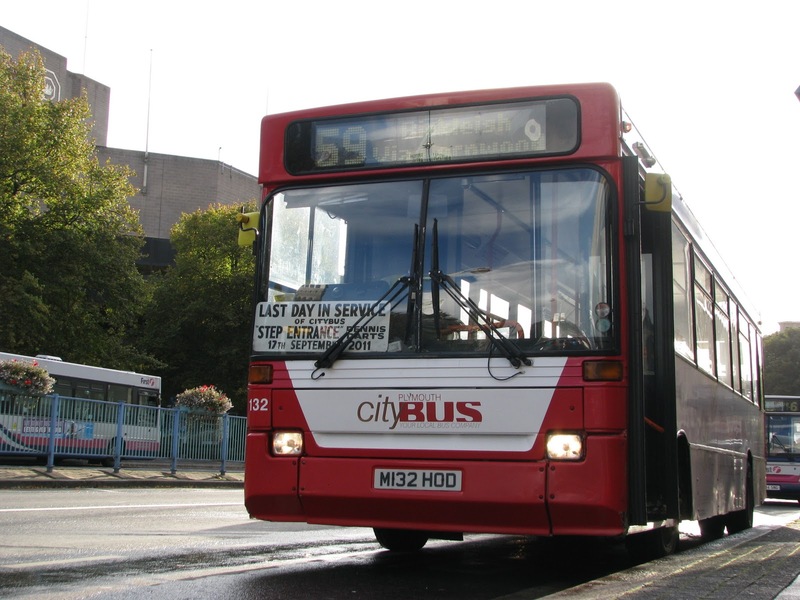 The 709 is still the ideal vehicle for the job, although with the reduction in frequency, the 709 may have capacity issues in the peak, but we shall have to wait and see how it copes! Unfortunately, I have indeed spoken too soon! After further research, we have found that she has only returned to the depot for staff shuttle work, and is not down here as a reserve bus to run in service. Who knows, maybe she will escape once or twice, but for now she's firmly out of service. This is what we like to see! 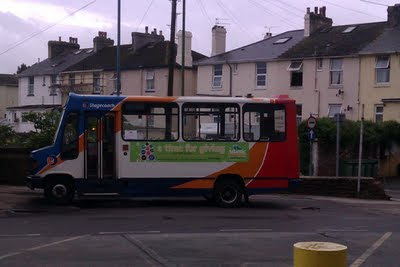 K803 ORL is seen here on Royal Parade on her first trip of the day at about half 7 in the morning, clagging like a beast! 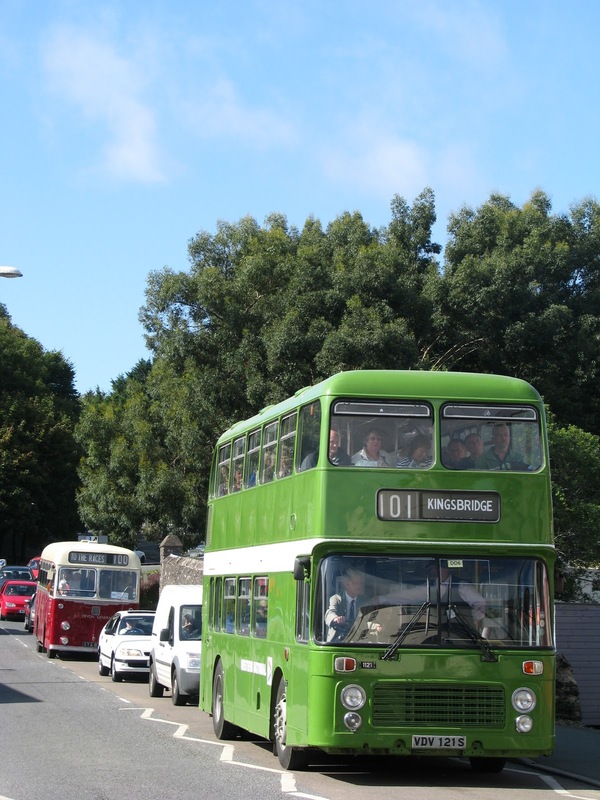 She was lucky enough to be out on the new service '7' in Plymstock. I say lucky, but actually there appears to be a decker 'turn' on the 7s, I've seen Olympians on it quite regularly since the start of operation. 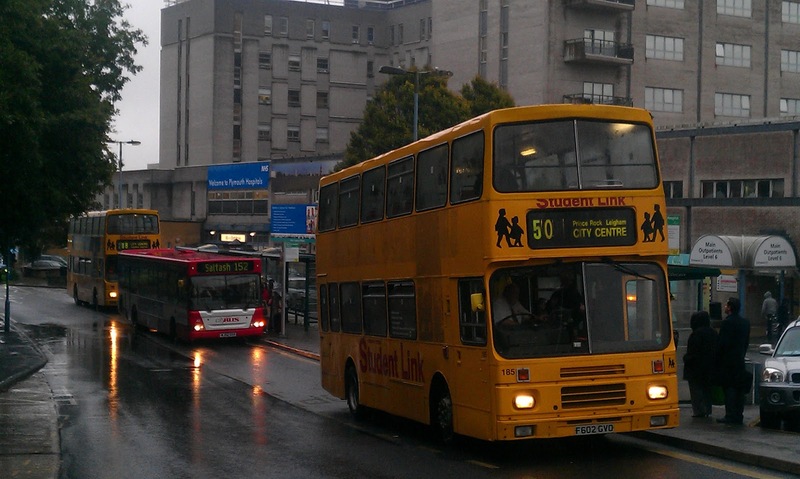 Seems slightly strange though seeing as Plymouth has lost so many low floor buses over recent months! I wouldn't say the 7 particularly needs a decker's capacity, although I'm happy to be proven wrong! 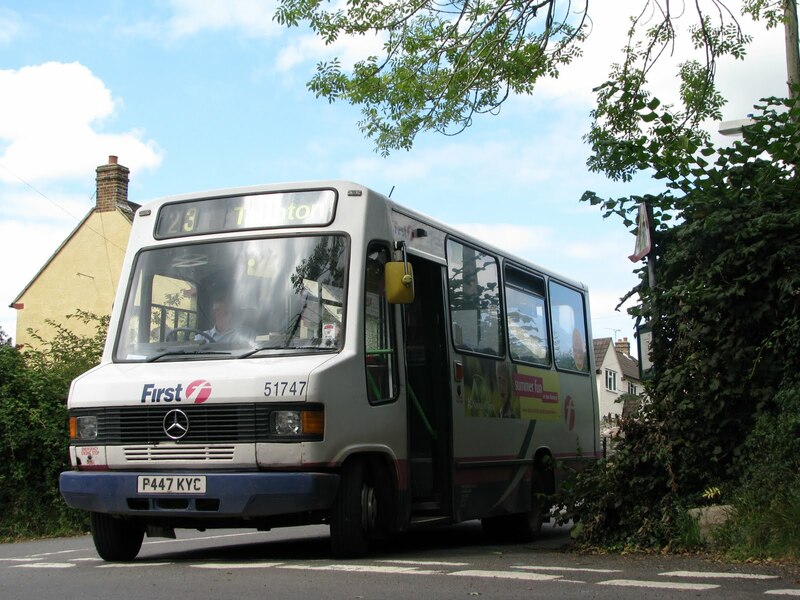 There are a dwindling number of locations that you can still get some decent Mercedes Minibus action in the UK, now that the Optare Solo is becoming ever more popular, and with the Wright Streetlite also starting to make a mark. Plymouth of course has now lost theirs, along with Paignton's main operation of the type now also gone. Of course Western Greyhound still run a sizable number of Varios, but even these are slowly disappearing with the introduction of more and more Solos. 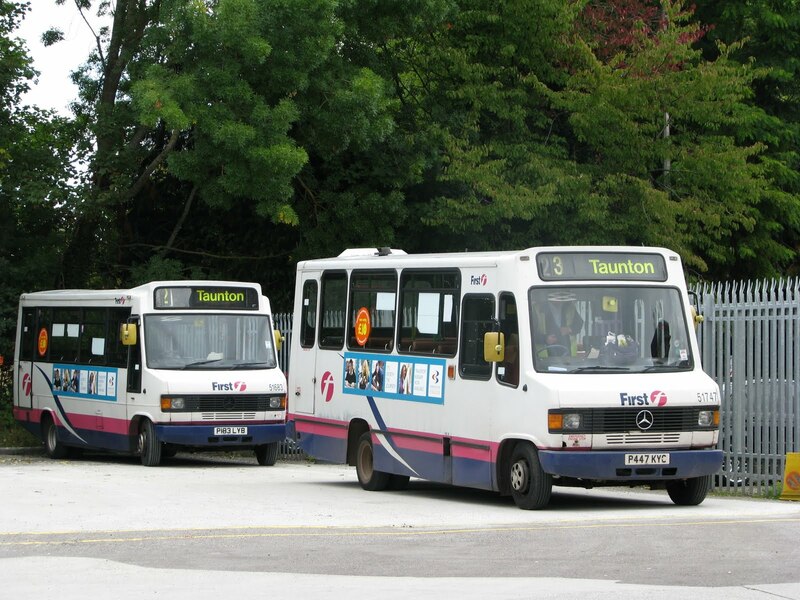 Taunton still operates a fair number of 709s and 711s, in my opinion, that bit more interesting than the Varios. 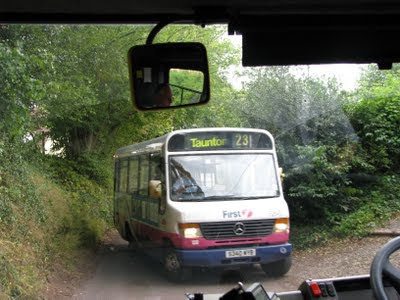 Taunton still operates a fair few of the type on core town routes, and on country trails through rolling Somerset, giving some really interesting journeys around the region. I took the chance to sample a couple before they do disappear from the streets, and they certainly don't disappoint! Firstly was a town trip on P182 LYA, a Mercedes 711D, new to Southern National, so presumably has run in Taunton for much of its life. This one really performed well, and made some lovely whining, so here's a video for you to enjoy! 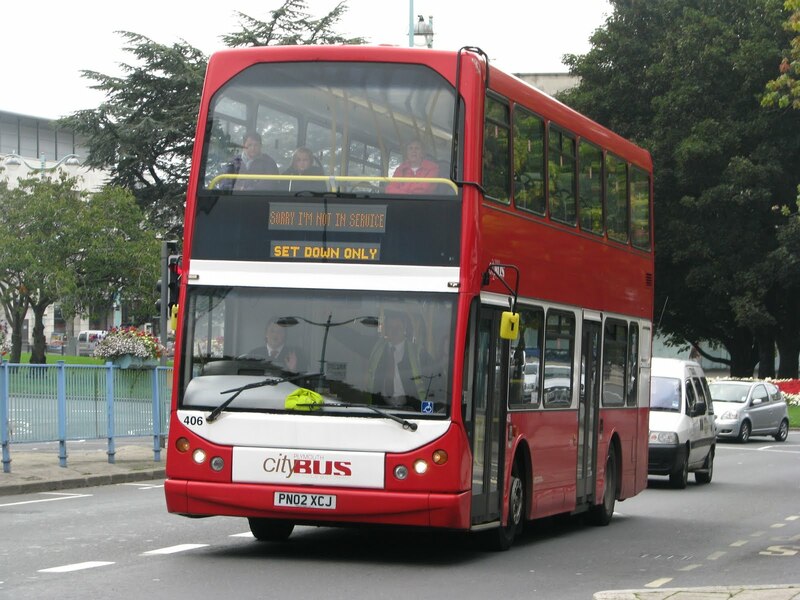 This size of bus is ideal for the route, there are some very tight manoeuvres around housing estates and in car parks, only a 'mini' Solo would be able to do the same work as these can. The second trip was on another one new to Southern National, P447 KYC. This is a Mercedes 709D with Alexander bodywork, and was somewhat more sluggish than P182 had been. Still a nice little bus, and a great route! Single track roads for most of the journey taking us through some beautiful little villages along route. Again, a route you could only fit small buses onto, and therefore the workings for the day were a 709 and a Vario. Got a gap to fill this Sunday? 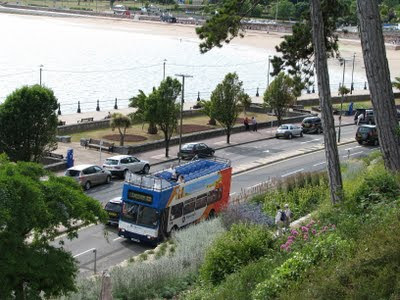 Never fear, because the The Devon and Dorset Group can provide you with a great day out in Torquay! The rally is now going into its 3rd year being run by the DDG, after two very successful rallies over the past couple of years. There's plenty of good variety on offer, from a half cab AEC Regents, to nearly new Dennis Enviro 300s, really someone to suit any interest. 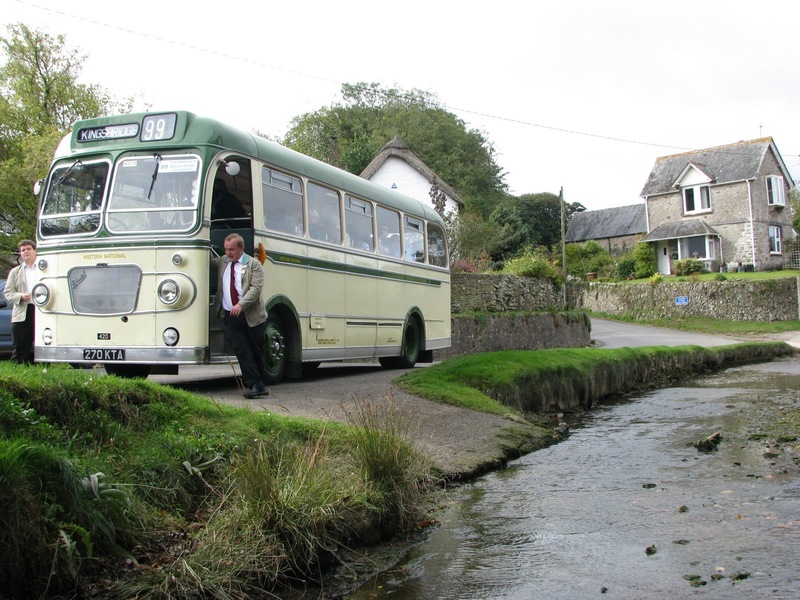 What makes this rally particularly great is the amount of services put on to enjoy. This year there shall be no less than 10 different bus routes in and around Torbay giving you the chance to sample a large variety of different vehicles. As a spotting location Torbay is brilliant! With the new Rockwalk now fully open, if you venture up there you can get some great shots across the bay. I have had a go myself a few months ago, so I've included a couple of sample shots below, but with a bit more practice, I'm sure you could do even better! It really is a great event, so certainly one to go to! A lot of time and effort is put into organising events such as this, so I'd like to thank the team of organisers in advanced! Now, all we need to hope for, is some decent weather!